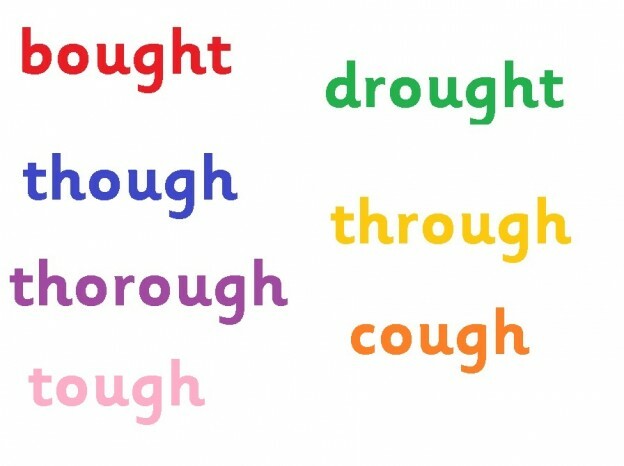 The spelling "ough" can be pronounced eight different ways in English. Don't panic, there aren't many words, and some of them are so arcane I usually don't bother teaching them. But let's be fairly comprehensive here. There are five different single sounds, and three sound combinations. "aw" as in bought, brought, fought, nought, ought, sought, thought and wrought iron. "ou" as in when the bough or the drought breaks, and the UK spelling of plough (in the US regularised to plow), as well as doughty old characters, the soughing wind and a deep slough of depression. "oh" as in dough, furlough and though, as well as doughnut and although, if you want to count them separately. "uh" as in thorough and borough, and names like Gainsborough, Marlborough, Peterborough and Scarborough. "u" plus "f" as in rough, tough and enough, plus a snake sloughing off its skin. "o" plus "f"* as in cough, former Australian Prime Minister Gough Whitlam and a cattle trough. "u" plus "p" in hiccough, though nowadays many people seem to spell this hiccup. That's it, as far as I know. Not so terrible after all. * The "gh" spelling of the sound "f" is also used in the word "laugh", and goes after a vowel. Before a vowel, "gh" usually represents the sound "g" as in "Afghan", "ghost", "spaghetti" and "yoghurt". This entry was posted in hard words, sound-letter links, sounds, spellings, vowels on May 14, 2014 by alison. I’m glad I found your site and this post. I have 4 kids who aren’t all that interested in reading…ages 10, 9, 6, & 5. I do a lot of reading aloud and I am finally learning that this is okay. I take some solace in the fact that even though I could read & loved to write, I hated reading. I did not learn to enjoy reading until I was 26. So, there is hope!